With Cesar Millan, the Dog Whisperer, filming all over the nation for his upcoming season of Dog Whisperer, he not only attracts millions of fans but he also gets attention from his numerous critics of his methods. Many animal experts and trainers say that Millan’s methods are unacceptably physical, confrontational, and risky. They fear that the way that Millan interacts with the dogs will lead to an increase in aggression, won’t lead to positive long-term results, and pet owners may be in potential danger when trying to follow Millan’s methods. An ASPCA spokesperson stated that he is: “disappointed that while we have made enormous advances in our understanding of the science, (the program) presents out-of-date techniques. It’s not necessary to physically manhandle a dog.” Some animal behavior experts are even saying that they are being hired to undo what Millan has done with a dog. One animal group, the International Association of Canine Professionals, does publicly support Millan and they say that Millan is showing people that there is help out there for troubled dogs. Millan is unfazed by the critics and says that most of the dogs that he works with “have an appointment to die” and that he would rather train a dog psychologically instead of physically but that does not always work. This entry was posted on Friday, June 1st, 2007 at 3:58 am	and is filed under Dogs, National Dog, Cat & Pet Info, Entertainment About Pets. You can follow any responses to this entry through the RSS 2.0 feed. Both comments and pings are currently closed. I like Milan, he’s a proponant of being a calm assertive pack leader among dogs. Not everyone has the ability to be calm and assertive. Most people don’t have the time or energy to give their dogs enough exersise, discipline, and affection which is what he is trying to teach people to do. My husband and I are luckily self employed so we can give our dog a ton of workouts and loving affection. The nudging Cesar sometimes does with his leg seems a bit rough at times but I don’t claim to know. 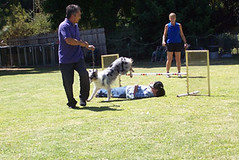 There are room for different methods to train dogs. But he works with hard cases that would be put to sleep otherwise. I like that he teaches people to treat their dogs like dogs rather that like people. But he’s not perfect. I’m sure he’d admit it. to be taken with a grain of salt. I like Cesar too, I think he’s brilliant and it’s clear that he loves dogs and they love him. From everything I’ve seen, he interacts with them in a way they instinctively understand, he NEVER corrects them with anger or with undue force, and though he’s firm, he’s also humane. I just finished Cesar’s book and I am a great fan of his show. I know that there are many people out there that are very outspoken, to the point of unsulting his character, about their negative feelings toward his methods. Even so, I have never read any quotes from Cesar in which he attacks other methods that work or other individuals that deal with dogs. I guess he’s chosen to remain “Calm and Assertive” over the whole thing. I admire him for that. A couple of months ago my husband and I adopted a dog with aggression issues. I imagine that his previous owners did not have the time or the compassion to deal with it so they tossed him aside. Through Cesar’s methods, we have seen a dramatic improvement and a chance for him to live a better, more normal life. What could be wrong with this? There are many people who might just want to put dogs with these types of issues to sleep. Not Cesar. Cesar sticks up for the dogs that can’t speak for themselves. I can’t say enough good things about him. I guess I’m just glad he’s out there! I love the way he thinks , I also agree with him in his training methods. I think we as people who say we love our animals should try everything it takes to try to save these troubled dogs so they to may have a long and happy,lovig life, to bad we cant save more of these poor dogs who were made to fight for thier lives in dog fighting rings. If anyone seriously believe that Cesar is too harsh on the dogs, then they clearly have not studied his TV shows or bothered to understand the angle he is coming from. Are you a pack leader or dog lover ? Are you trying to assert human values on a dog ? Dog’s naturally treat each other rough and play rough so to say a nudge here or there is wrong or too harsh is completely out of context. Also he deals with “red zone” cases often which require hard handling and where most so called dog experts would have the dog destroyed he does reabilitate. I have seen other so called dog experts on TV and they all are insignificant in contrast to Cesar’s understanding of dogs. There will always be critics. The results are what evaluates a person techniques. Ceasar is always successful and I love him and his show. I have used some of his techniques on my dog and it’s amazing. My dog is like my child. He is calm, he is healthy and he is happy. That is what is important. Folks have to understand that it is very hard to condense an entire day of work with a dog, into a ten to fifteen min. TV segment. The show is there only to prove that it IS possible to help even the worst “red zone” cases. The Dog Whisperer came out on the air about six years ago, my dog Early is six years old and I have never had to lay a hand on her. Sure, I’ve done the “touch” and only then matching her level of energy, this is only to snap her out of it and never done in anger or frustration. And thats the thing, there is no reason to punish a dog, this only vents your frustration out on the dog, they don’t know why you are treating them mean or why you are hitting them. If you address a dog physically you are only doing so to set boundaries and assert your position as pack leader, not to beat it into submission. Beating pisses dogs off, they have sharp teeth and they will win. It’s funny how most of his critics are other dog trainers… I betcha they aren’t nearly as successful as Cesar is in half his cases. They just want 15 min. of fame in a newspaper ad. And the everyday people who complain probably don’t have very stable dogs and think being excited, aggressive or just plain stubborn is a ‘happy’ state for a dog.